Low back pain is can be incredibly painful, and often scary. If something hurts really bad, we assume that it must be a sign that something is really wrong. However, in most cases, low back pain is nothing serious...it just hurts like the dickens. Last post we looked at research showing that just knowing more about low back pain can actually improve the pain itself. Here are a few important facts to keep in mind to help decrease your fear, anxiety, and hopefully your pain. Most patients with low back pain return to normal function within about 1 month and have resolution of their pain within about 2 months.5 Notice, you should not wait until your pain goes away to resume your normal activities. Approximately 40-80% of adults without back pain have at least one bulging or herniated disc on their MRI. About 70% have at least one degenerative disc, and this number increases to 93% after 60 years of age.2 Changes in spinal structure appear to be a normal part of aging, so MRIs are not particularly helpful in diagnosing most causes of low back pain. About 85% of cases of back pain have no specific structural cause.3 This is likely because pain is "an unpleasant sensory and emotional experience associated with actual or potential tissue damage, or described in terms of such damage. "4 This means tissue damage is neither necessary to have pain, nor is tissue damage alone enough to cause pain. Thoughts and feelings (belief that pain is harmful, fear of movement or activity, fear that pain will persist, depression, job dissatisfaction) and lifestyle habits (smoking, lack of physical activity) are much better than MRI findings at predicting which patients will get better and which patients will have long-term pain and disability.6–13 This is good news! This means you are in control of whether or not you will get better. Although back pain usually gets better quickly, about 60-86% of people have a recurrence of their low back pain within one year.14 Exercise and education programs have been shown to lower the risk of recurrence.14–17 Therefore, your treatment is not over when your back feels better. Staying healthy requires long-term lifestyle changes. 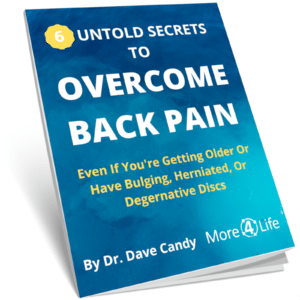 Whether you have low back pain now, or in the future (because 85% of us will at some point), keeping these facts in mind could be the difference between recovery and ongoing suffering. If you need further help, we love helping people overcome low back pain so they can get back to living the active, happy, healthy lives they dream of! If you'd like to discuss your particular back problem with our back pain expert, Dr. Dave Candy, click on the button below to schedule a FREE phone consultation! Talk A Back Pain Expert! Airaksinen O, Brox JI, Cedraschi C, et al. Chapter 4. European guidelines for the management of chronic nonspecific low back pain. Eur Spine J. 2006;15 Suppl 2:S192–300. doi:10.1007/s00586-006-1072-1. Deyo RA, Weinstein JN. Low back pain. N Engl J Med. 2001;344(5):363–70. doi:10.1056/NEJM200102013440508. Abraham I, Killackey-Jones B. Lack of evidence-based research for idiopathic low back pain: the importance of a specific diagnosis. Arch Intern Med. 2002;162(13):1442–4; discussion 1447.
International Association for the Study of Pain Task Force on Taxonomy. Classification of Chronic Pain. 2nd ed. (Merskey M, Bogduk N, eds.). Seattle: IASP Press; 1994. Henschke N, Maher CG, Refshauge KM, et al. Prognosis in patients with recent onset low back pain in Australian primary care: inception cohort study. BMJ. 2008;337:a171. Carragee EJ, Alamin TF, Miller JL, Carragee JM. Discographic, MRI and psychosocial determinants of low back pain disability and remission: a prospective study in subjects with benign persistent back pain. Spine J. 2005;5(1):24–35. doi:10.1016/j.spinee.2004.05.250. Candy, D. Overcoming Low Back Pain: 6 Simple Solutions To A Complex Problem. St. Louis, MO: Movement 4 Life; 2018. Fritz JM, George SZ, Delitto A. The role of fear-avoidance beliefs in acute low back pain: relationships with current and future disability and work status. Pain. 2001;94(1):7–15. George SZ, Fritz JM, McNeil DW. Fear-avoidance beliefs as measured by the fear-avoidance beliefs questionnaire: change in fear-avoidance beliefs questionnaire is predictive of change in self-report of disability and pain intensity for patients with acute low back pain. Clin J Pain. 2006;22(2):197–203. George SZ, Calley D, Valencia C, Beneciuk JM. Clinical Investigation of Pain-related Fear and Pain Catastrophizing for Patients With Low Back Pain. Clin J Pain. 2011;27(2):108–15. doi:10.1097/AJP.0b013e3181f21414. Thomas E, Silman AJ, Croft PR, Papageorgiou AC, Jayson MI V, Macfarlane GJ. Predicting who develops chronic low back pain in primary care: a prospective study. BMJ. 1999;318(7199):1662–1667. doi:10.1136/bmj.318.7199.1662. Swinkels-Meewisse IEJ, Roelofs J, Schouten EGW, Verbeek ALM, Oostendorp RAB, Vlaeyen JWS. Fear of movement/(re)injury predicting chronic disabling low back pain : A prospective inception cohort study. Spine (Phila Pa 1976). 31(6):658–664. Campbell P, Foster NE, Thomas E, Dunn KM. Prognostic indicators of low back pain in primary care: five-year prospective study. J Pain. 2013;14(8):873-83. doi:10.1016/j.jpain.2013.03.013. Fritz JM, Hebert J, Koppenhaver S, Parent E. Beyond minimally important change: defining a successful outcome of physical therapy for patients with low back pain. Spine (Phila Pa 1976). 2009;34(25):2803–9. doi:10.1097/BRS.0b013e3181ae2bd4. Hides JA, Jull GA, Richardson CA. Long-term effects of specific stabilizing exercises for first-episode low back pain. Spine (Phila Pa 1976). 2001;26(11):E243–8. Soukup MG, Glomsröd B, Lönn JH, Bö K, Larsen S. The effect of a Mensendieck exercise program as secondary prophylaxis for recurrent low back pain. A randomized, controlled trial with 12-month follow-up. Spine (Phila Pa 1976). 1999;24(15):1585–91; discussion 1592. Soukup MG, Lönn J, Glomsröd B, Bö K, Larsen S. Exercises and education as secondary prevention for recurrent low back pain. Physiother Res Int. 2001;6(1):27–39. George SZ, Childs JD, Teyhen DS, et al. Brief psychosocial education, not core stabilization, reduced incidence of low back pain: results from the Prevention of Low Back Pain in the Military (POLM) cluster randomized trial. BMC Med. 2011;9(1):128. doi:10.1186/1741-7015-9-128. Flynn T, Fritz J, Whitman J, et al. A clinical prediction rule for classifying patients with low back pain who demonstrate short-term improvement with spinal manipulation. Spine (Phila Pa 1976). 2002;27(24):2835–43. doi:10.1097/01.BRS.0000035681.33747.8D. Better yet... Just call us! The only things you have to lose are your pain, worry, & suffering! Childs JD, Fritz JM, Flynn TW, et al. A clinical prediction rule to identify patients with low back pain most likely to benefit from spinal manipulation: a validation study. Ann Intern Med. 2004;141(12):920–8. Fritz JM, Childs JD, Wainner RS, Flynn TW. Primary care referral of patients with low back pain to physical therapy: impact on future health care utilization and costs. Spine (Phila Pa 1976). 2012;37(25):2114–21. doi:10.1097/BRS.0b013e31825d32f5.